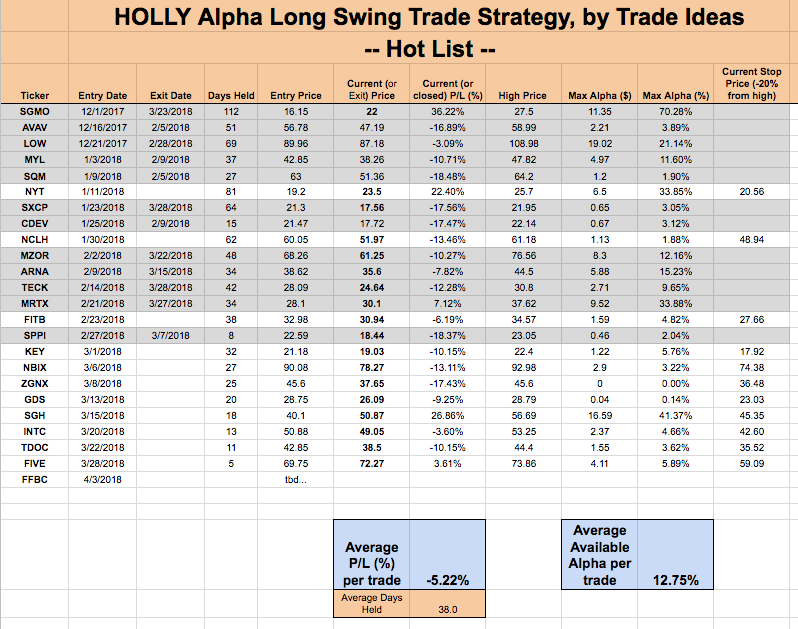 Tomorrow’s addition to the HOLLY Hot List isn’t exactly getting pummeled in recent market action (…and that’s what I love about it). But the overall markets are having a rough go of it. And if you’re a believer that big bull markets are led by banks and financials, then buying the market’s blood in the form of shares of $FFBC will likely yield a market leading position when this storm passes (they all do). The weekly chart of $FFBC forms a beautiful high flag pattern going back to 2016! And right now, we’re only about one-dollar away from breaking out to new all-time highs. Considering all the general market has thrown at us since February 1st, to see this stock holding up so nicely just under all-time highs is a blaring sign that says institutions are accumulating this stock. Won’t you like to join the ride? As always, we’ll be trailing our position with a 20% trailing stop loss. Since our last dispatch, we’ve shed two more positions: SXCP and TECK for 17% and 12% losses, respectively, if you held each to the stop loss. At least TECK offered us as much as 10% of upside before reversing on us (but you had to be quick!). The bad news is several of our existing positions have broken some important support levels in recent trading days, so we’ll be rooting for a bounce in the market to help repair our charts.